The Red Sea was my favourite diving destination in the 80ties and 90ties. 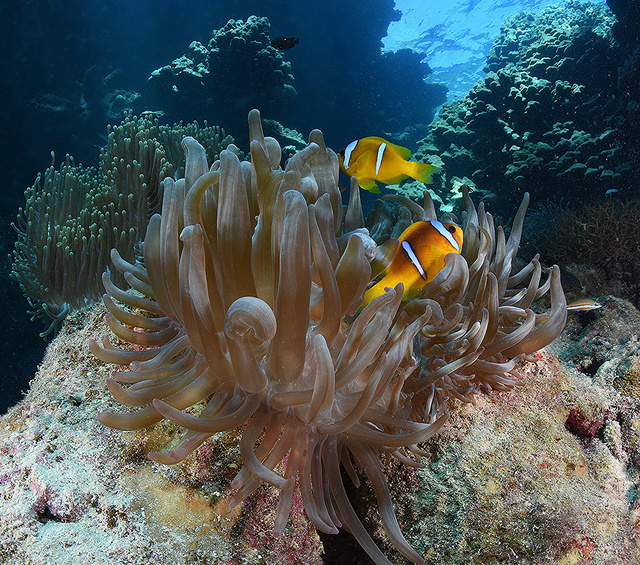 With its great variety of soft and stone corals and fish swimming in blue water, its a real colour paradise. My first trips went to the Sudan reefs were we camped on Sanganeb, an atoll with a light house not so far from Port Sudan. We had everything there: amazing reefs covered with huge stone and soft corals and swarms of colourful fish, two compressors, food and a small diving boat, but.. no cold beer. At Sanganeb we must have been one of the first groups that started using small pieces of bait to attract the grey reef sharks at the south-west point. At the same site one could meet schools of hammerheads (Sphyrna lewini) at a greater depth and usually with a strong current. 20 miles north of Sanganeb lies Shab Rumi ('roman reef'), the site were Cousteau built his legendary Conshelf II underwater project in 1963. Only the mushroom shaped garage of the underwater scooters was left over to visit and parts of the shark cage used by the researchers.